I decided to get busy and buckle down and just finish this thing! I had occasionally made a few of these "biscuits" needed for the top - but I found it tedious and not very fun, so I kept putting it off. I had fewer than 100 of them finished when I knew I would have to force myself to make at least 20 per day. I figured I could do that many - even if they were boring to make. I first made the biscuits - all 441 of them. 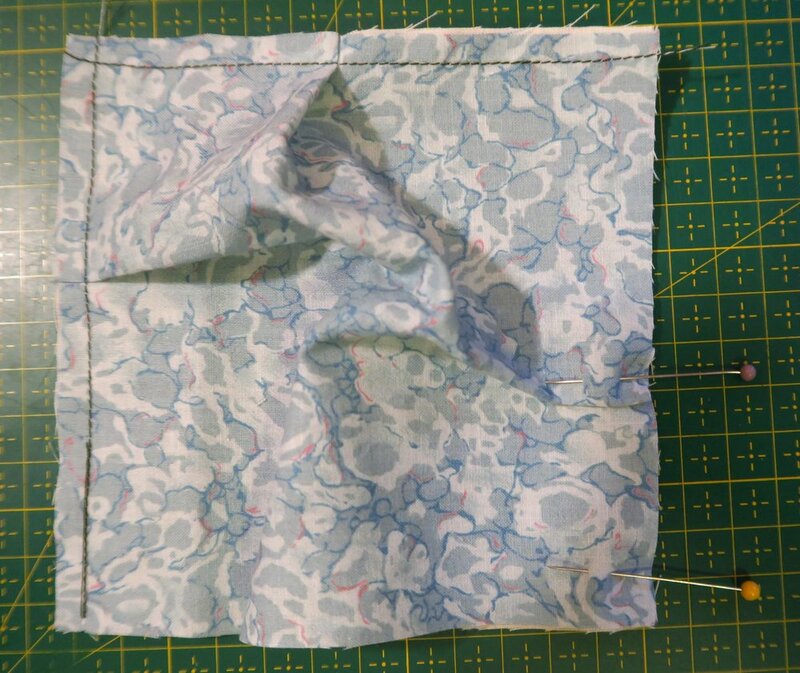 That involved cutting out 5" white squares or off white or some fabric that will never been seen and 6" upcycled blues/greens fabrics - used in other tops in this series-- and sewing them together after stuffing the middle with polyester fiberfill. I used the batting trimmings from the previous quilts made in this series. Let me tell you - this is one seriously heavy quilt! I may have made my puffs a bit bigger than some people! It is definitely going to be warm! My sis told me it is a very odd looking quilt top! In many ways I agree! I made the individual puffs - all of them - before I began putting them together. They were somewhat difficult to sew together as they were filled with polyester fiberfill which means for me anyway, leftover poly batting pieces. The individual blocks were 5" square. I cut 6" white pieces of fabric and then 5" pieces of blues. I sewed them together making a pleat in the blue fabric to make it fit the background white. I finished three sides of them, made a bunch, and then filled them and finished off the fourth side. I took a series of pictures for you that explain this pretty well. 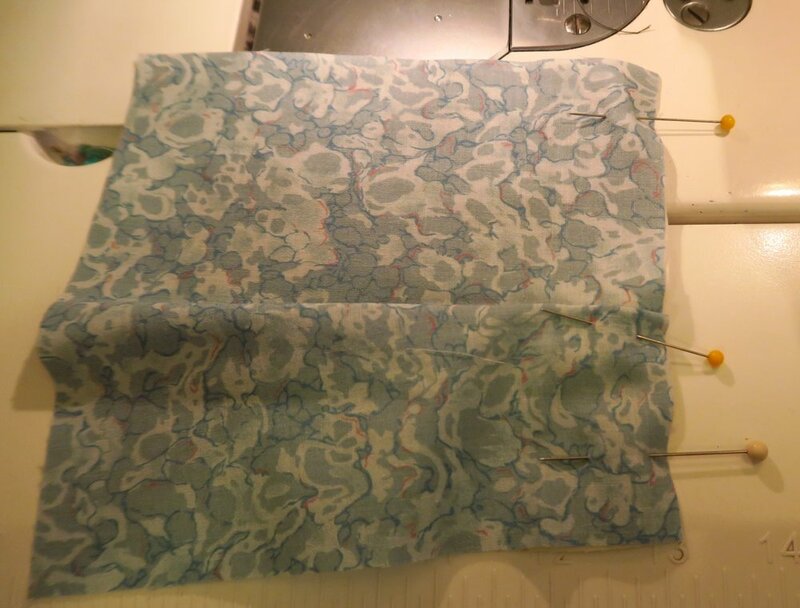 Pin a pleat into the blue to fit the white backing fabric. Sew the side along the pleat, at 1/4” or less. A tad bit less is best. All sewn down. One side done. Pin the next side, folding a pleat into the fabric so that the 6” blue fabric fits to the same size as the 5” white backing. Sew the pleat in along the side at 1/4” or less. Pin the third side of the blue fabric to the white backing, folding in and pinning a pleat in as you did the other two sides. 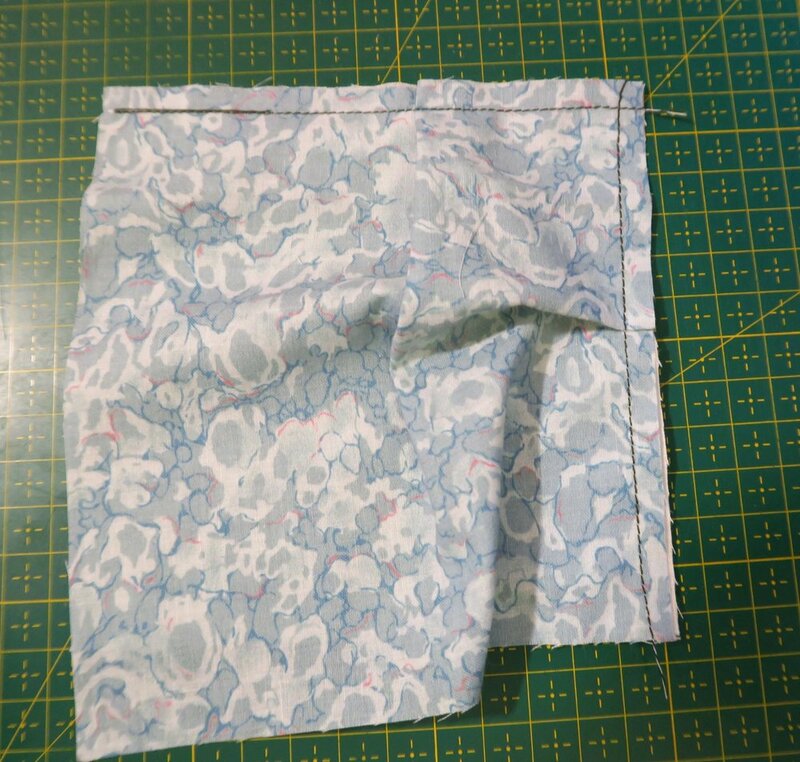 Sew the seam at 1/4” or less. You now have 3 sides finished. Stuff a bit of batting in there - perfect chance to use up some batting scraps. I used poly. Pin the last side shut as you did the others, only pushing the batting to the middle away from the seam. Sew along the fourth side. 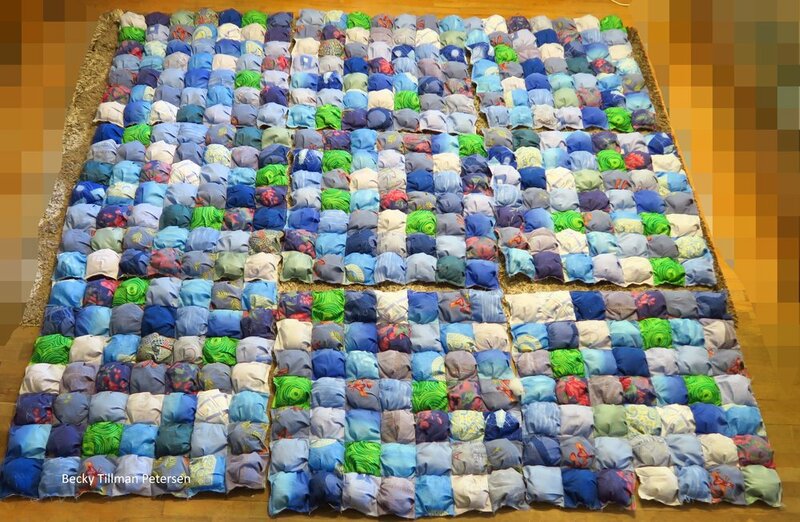 Now go make 440 more of these if you want your quilt to be the size of mine! I knew I was going to be sewing these together, so I tried to make the pleats in the sides in different spots so that I could avoid huge lumps when sewing the two puffs together. When I sewed them together, I sewed a couple together and then sewed those two together and so on. I tried to use 1/4" seams, but they ended up being a bit bigger than that. This picture shows that I managed to make the pleats hit at different spots,. That was a happy accident. I was more concerned with colors in the final top than in where the pleats fell. Here's a close up of a 7x7 "patch" of biscuits or puffs. I made 9 of these. I sewed them together in a 7x7 layout - I made 9 of those big squares! I then put them on the floor trying to make sure no identical squares met. I then took those enormous things and sewed them together in rows - just like a giant 9 patch. And I was done with the top! It's incredibly heavy. The top isn't finished yet - but I'll share what I did when I get if all bound. This one has the batting in each square, so I don't think you are supposed to put another layer underneath this "top" - it really would be hard to even haul around. Of course you can do anything you want to - but for the weight of the quilt, it isn't necessary. Of that I am certain! As it is it is definitely a mid-winter quilt. I'll weigh it when I get it all finished. Maybe I stuffed my "puffs" a bit too full! We'll see. I haven't bound it yet - but I have tacked the backing on to it. I decided to wait til a bit cooler weather to haul this around. I don't know if I'll ever make another biscuit quilt in my life. I'm glad I've made this one - at least at the point where it is - I have no reason to not finish it. I suppose if you were seriously in love with your fabrics (I wasn't! ), it would be fun to make - I'm thinking maybe some gorgeous florals and such. Mine were a bit boring - especially since I've been working with these same fabrics for months now. And that's what's been happening in my part of the world with quilting, anyway! Be sure to check out what my sis has to offer in the store!